So it’s been a while and I thought I would start with my latest piece of kit. 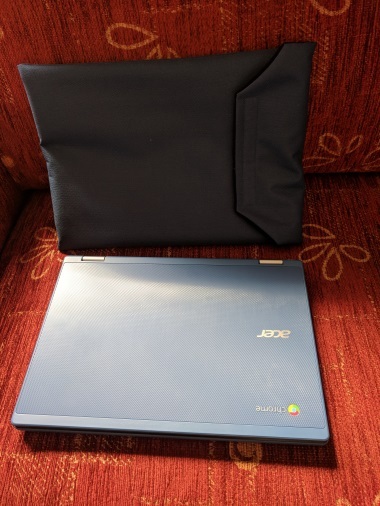 Chromebooks have been around for a while and haven’t captured a lot of the market in the UK. In the USA, however, they have been competing with Apple in the education market and have taken schools by storm as the students love the idea of a keyboard and the lightweight functionality of a Chromebook over an IPad. There are various manufacturers of Chromebooks and I did a little research before I purchased my one. So what did I go for? 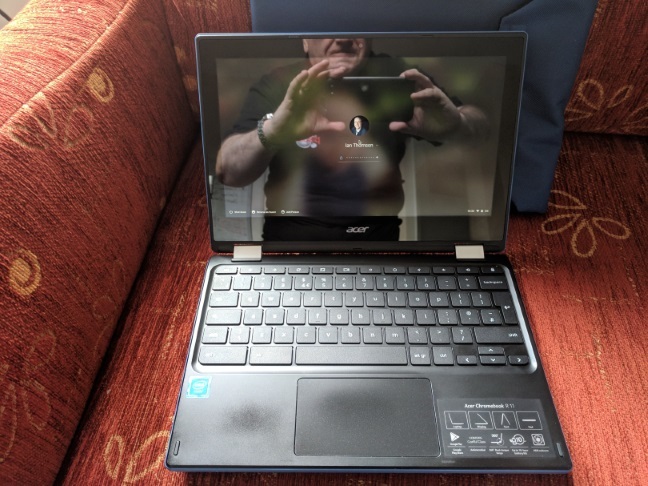 This is a relatively new Chromebook in their range and this allows it to run Android Apps from the Google Play Store, as well as the Chrome-based apps, from the web store. This appealed to me as I wanted something to replace my ageing Nexus 9 tablet as it seems that Google has decided to drop the tablet market and launched all their Pixel Books instead, which are rather prohibitively priced. This particular Chromebook is lightweight and 11-inch screen makes it very clear and visible. It also has the lovely function of flipping 360 degrees to create an 11-inch tablet. So it ticked a lot of my boxes. Larger than I had been carrying around, but I was prepared to make that sacrifice. Battery life claimed to be around 10 hours when charged as well. However, I am finding when fully charged it is telling me around 7 hours…. Slight discrepancy there Acer. 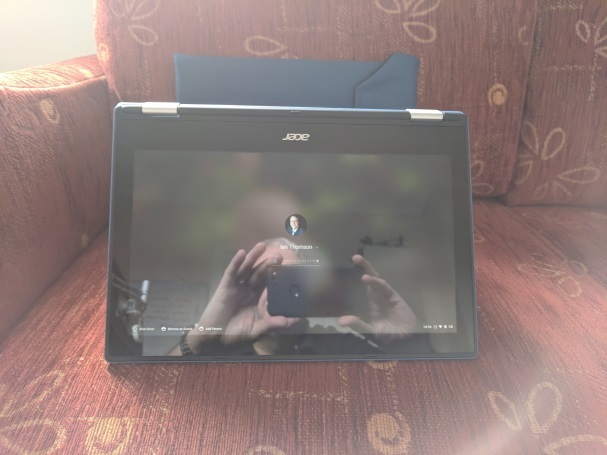 However after some initial problems when I received it, I finally got a working Chromebook and have been using it as my tablet replacement for a few months now. Boots up fast as all SSD drives. 4 GB of Ram and 32 GB of internal storage, the rest of the cloud. High relation screen and camera for video calls etc. It is Blue the one I got as you can see from the photos attached. So how do I feel it has been going? So far it has been good going and I have been able to do all I want on this device. It is fast enough and covers all my bases. The only faults are that the use of an emulator to run the Android Apps is sometimes very buggy and resizes the screen and crashes at times. I have wandered over to the web-based apps for so many things and they run marvellously on the Chromebook. It allows me to carry out all my online worm and to edit a document using the Google Apps suite and then save them to the cloud and access them at my desk and phone when I need to. I haven’t outputted the display yet through the HDMI port, but I have cast it through a Chromecast and it works well. Chrome as an OS is adequate and easy to get to grips with. Automatically updates and keeps me on top of what is happening. It connects to any Wi-Fi I have tied so far and does it fast. Speakers seem OK as well and can play audio nicely. I think this is a good replacement for my Nexus 9 and will be happy to use this into the future. Acer, after I purchased this, have launched a Chromebook Tablet. 10 inch. Again to compete in the Education market in the USA. However, it is making its way to the UK market in May time. So that will be one to watch. Will run Chrome OS and allow the use of Android apps as well. Let me know what you think and do you think the age of Windows ruling devices is over?